A new member, Marion, is interested in what anyone here had to say about an Islander Supreme Dodge Camper Van. She says it has 160,000 clicks on the odometer. She's a senior who would be camping with her 14 year old grand daughter. Does anyone here have any advice for Marion? I'd be worried about the high mileage. Fluids, filters, belts, hoses, plugs etc. might all need changing. Definitely have it checked out by a mechanic. If the tires are more than 5 years old they might need replacing. Have the brakes and suspension checked out. Check for rust as well. Transmission might need to be rebuilt. Last thing you want is to get hit with a huge repair bill. 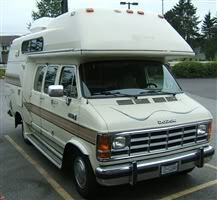 If I were buying an older high mileage van I'd make sure to allow $2,000 or $3,000 in the budget for repairs. I'll double what Marco Polo says and add to have bearings and driveshaft (U joints) checked. Without knowing the service record also try to see if it is burning oil and have a mechanic check it too. I feel the chasie is the most important because that can get you home but also how is everything inside too like ref, AC etc. Just a note to let you know I'm still enjoying my 89 van. I spent a month on Tchesinkut lake with 2 grandsons, they are looking forward to next year. I do have leak problems ,but carry a caulking gun with me , hopefully one day they will all be gone, only one showed up this year. Hey Marion, the leaks I had were from the windows . I've replaced all the vents, resealed all running lights and had the windows removed and resealed, but that thing still leaked ! So out came the windows again, laid them flat on a bucket and poured water on them. Sure enough the 2 windows on the driver's side leaked about as fast as the water was poured, so we permanently siliconed the bottoms where the rubber meets the glass , and '' fixed'' the problem ! It's a good year , first year of the magnum engines. Pictures would help, up in Canada that model can fetch 22 grand . Receipts for continuous servicing , maintenance , paint condition may boost the price.